Dozens of civilians have reportedly been killed in a fresh attack in Nigeria's northeastern Borno State by Boko Haram militant group, witnesses said Sunday. According to witnesses, over 30 Boko Haram militants on motorcycles stormed Shani, a predominantly Christian area, south of Borno State on Saturday night. "They came at about 8pm and started shooting. The gunshots were so much that I decided to run out of the house with my two grown-up children but left my wife and younger children. We hide in the bush and proceeded toward Biu this morning," Ezekiel Musa, an eyewitness, told the Turkish press agency AA. He said the insurgents also set fire to houses to force residents out and then opened fire on fleeing residents. He disclosed that he was unable to connect with his wife and younger children he left behind in Shani since Saturday night because "the Boko Haram men destroyed the telecommunication masts in the town." "I saw the facilities at the base of one of the masts on the outskirts of the town on fire as we flee," he told AA on phone, adding that he could make calls because he was already approaching a village near Biu, about 189 km from Maiduguri, Borno's provincial capital and Boko Haram birthplace. Shani town is sharing borders with some Adamawa State communities and about 260 km drive from Maiduguri. Mustapha Umar Shani, a college student, told AA on phone that he escaped into a community along Shani-Adamawa border but said he feared the insurgents may still be in Shani. "I'm now in Pakaina village with other fleeing residents," he disclosed. A military source in Biu confirmed the attack, adding that the insurgents burnt down a police station and other public buildings. Shani has been under Boko Haram fire in the past. The Saturday invasion was the third since 2009 when insurgency escalated in the northeastern Borno State. The town came under heavy attacks shortly before the 2011 general elections as suspected Boko Haram raided the local office of the Independent National Electoral Commission (INEC), killed several people and destroyed electoral materials. The Shani Divisional Police Station was also attacked in mid-June 2014, during which as at least five policemen were killed. 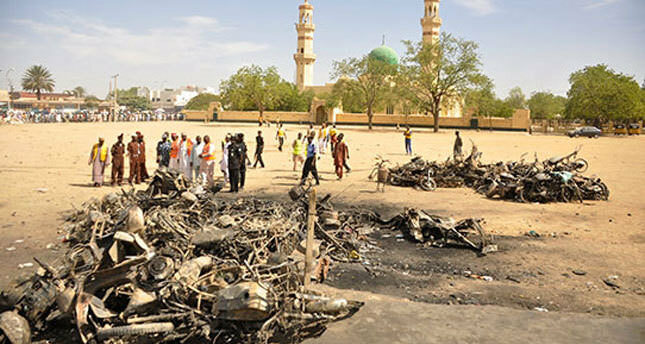 More than 300 civilians have been killed in coordinated attacks by Boko Haram across the north in November alone, the latest of which targeted a major mosque in Kano city on Friday where over 100 worshippers were killed. A twin bomb explosion near a regional market in the northeastern city of Maiduguri also killed about 30 traders mostly women and teenagers last Tuesday.